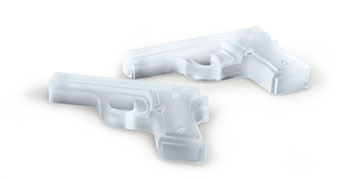 “Pop a Cap In Your Glass,” says the manufacturer of these gun-shaped ice molds. It’s a good thing that gun violence isn’t a problem in America, or this would be in extremely poor taste. There’s also an ice-cube tray that makes tiny AK-47s, in case you need a fully-automatic cold drink. Of course, it’s the “I (shoot) MY DAD” pint glass that’s the cherry on the sundae of this terrible idea. Patricide isn’t just for the Romans!